After nearly two years after leaving Quito and learning to live in a colder climate high in the mountains, I have managed to uproot myself again. The house I had been living in was charming in many ways. And also had its challenges, which finally got to me. Like the cold. And the fact that not a single month went by without water shortages or electric blackouts, sometimes on a weekly basis. The house hadn’t been maintained properly for years, and I had to deal with several burst pipes and leaks from the roof. Most importantly, the rent was just too high, considering all the inconveniences. Best of all, the rent is less than half what I have been paying. That makes me really happy! This was another opportunity to sort through all my belongings and purge some more. And yes, the bulk of what I have kept has to do with sewing. Of course. Still, I find having to pack and move is a pretty traumatic experience. And this will not be the last move, either. Hopefully the next one will be permanent, as I am planning to build my own home on our property, right next door to my mother. That will take some time, so for the time being I am planning on being here for at least a year. It took me nearly 3 months to settle in last time. This time I feel even less motivated to unpack, knowing that it is just a matter of time before I have to go through it all again. 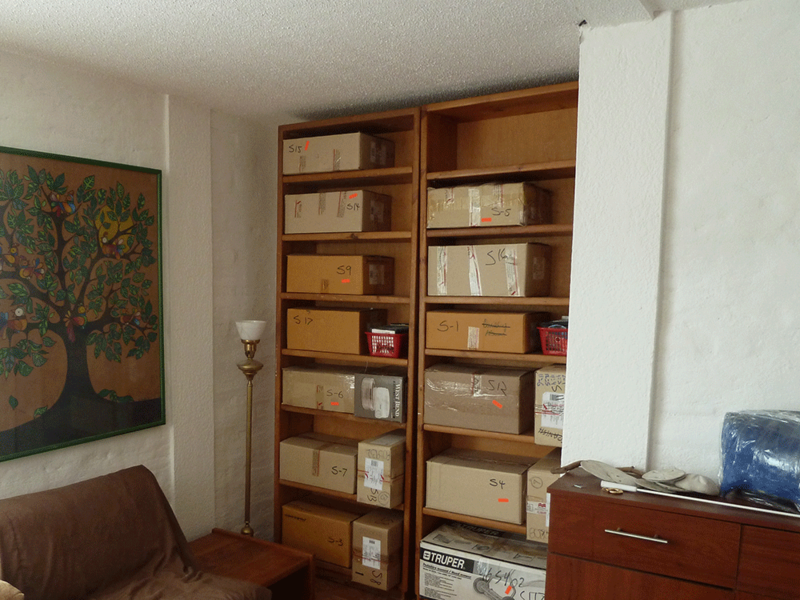 The bookcases are up, and the books are on the shelves… still in boxes. And I think I’ll leave them there. At least this time I was so organized, I actually have a list for all the items in each box. So, if necessary, I can find what I need without having to open them all up! The area I would like to set up for sewing was designed as a small sitting area on the second floor and is also quite a bit smaller than what I’ve been used to. So a lot of things will have to remain packed for the time being. Obviously, I do have to set my machines and some tools and supplies, no matter how minimal. I won’t make it through the year, otherwise, right? And the rest will have to wait until they can be moved to a new, bigger home. So this obviously is not my dream house and things feel rather tight. That’s the down side. The upside is that my pets LOVE it here, and that this situation will at the very least help me develop a sense of humor. Such as… now bear with me as you try to visualize this. The bathroom is about the size of an airplane bathroom, plus a very small shower. I fit in it and can actually turn around, as long as it’s on my axis. And that’s about it. 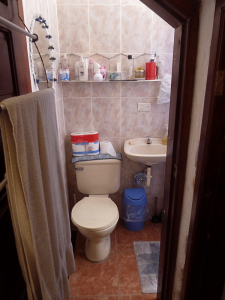 The toilet… Well, just let me say if you sit down, you can’t close the door. Hmm.. Stand and try aiming if you want privacy? I think not. The door will remain open. Angie, my heart goes out to you. Hopefully you’ll be so busy the time will pass quickly andl you will be in that new permanent home. 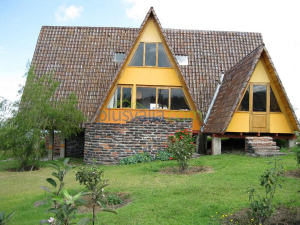 Moving is a terrible ordeal to go through, at leasst this time you’ll be warm. My thoughts and warm wishes are with you. I love that you’re closer to your mother. Oh My I feel for you. My husband and I retired and moved to a different state. From Oregon to Arizona. And we too did it in stages. From a 3 bdrm house to a 2 bdrm apartment and now to a mobile home. 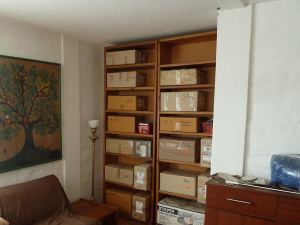 So each time there was sorting – tossing and packing. I am just now getting settled again after 3 months and haven’t blogged for all that time. Good luck with your temp home – and building your perm one. Thank you for all your patterns and designs – I truly enjoy them. Small can be intimidating, but it can work out…been there, done that before. I lived in a very tiny house once, it was wall to wall furniture. Only way to get to the dresser was crawl over the bed and back, no walking around the bed..lol The bathroom, let’s just say it was challenging..lol It was so small, when you ‘set down’, your feet was in the tub..LOLO, but, the door did close.. You’ll have many laughs I’m sure.. Glad it’s warmer for you. I so enjoy your patterns, thanks. I just had to laugh at the toilet. No sorry that’s a picture that’s staying – LOL. At least you are close to your mother and hopefully you will be so busy that the year will pass quickly. It’s definitely better to be warm that freezing. We so never expect or imagine some of the obstacles in our lives!! I have certainly enjoyed your latest move and how you are making the best of it! Being close to Mom and warmer weather is so worth the inconvenience not to mention power surges and unwanted water falls! Wishing you the very best Angie! 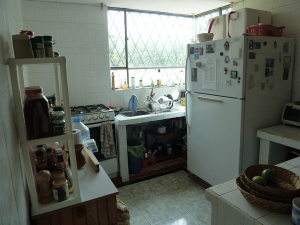 Por fuera la casa es muy bonita la forma. Claro, bastante más estrecho pero tiene más pro que contra. Además hay un dicho que no sé si lo conoces: Al que se muda, Dios lo ayuda. Así es que seguramente es por algo bueno pasar por esa casa. Glad you’re warm and the roof doesn’t leak! LOL. It’s a blessing that you can be near your mother. Treasure her companionship while you can. 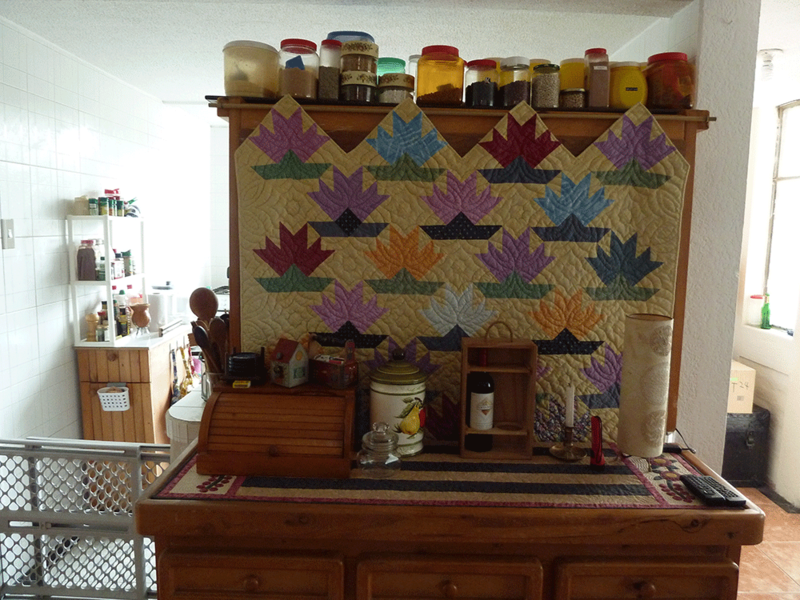 Also, I would love to know if the quilt with the flowers hanging over your hutch is on the website? I’m a member of the Bit’s and Pieces site, but not the other two. If you would please let me know I would appreciate it greatly. Best wishes in your newest home. Bunnye, that is an old quilt. Can’t remember the exact date I made it, but it could be anywhere from 15-20 years old. Long before I started designing. So no, I never wrote a pattern for it. But it is one of my favorites, so maybe I should do so now. Maybe for early 2015? Will do my best…. Oh Angie!!!! I’ve walked in your shoes before! During the real estate boom…everyone was selling. As for sale signs went up, we lived a year here, a year there. Nothing like strangers wandering thru your rental. 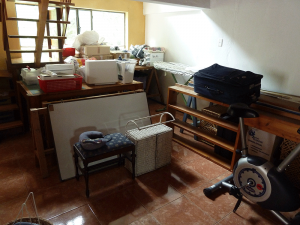 2012 was our year…we got our house (TLC needed).but no more moving! When getting ready to move I’d have to “close down” my sewing area and pack up everything 3 months early just so I could pack the rest of the house. I did what you did and taped a list of box contents on everything. 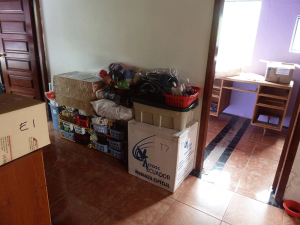 And just like you….we stopped unpacking boxes as well. Creativity becomes your middle name when you have space constraints… just think….you may end up inventing a space saving idea that goes viral!!!!! Love your sense of humor….much needed in your journey! Wishing you the best of luck. Hola Angie! desde que nos compartiste tu mudanza a la casa de las montañas, supe que no pasarías allí mucho tiempo. La vista y el ambiente maravillosos, pero la soledad, el frío, la distancia, más tantas cosas que ahora nos comentan, haría que te movieras más cerca de tu madre. 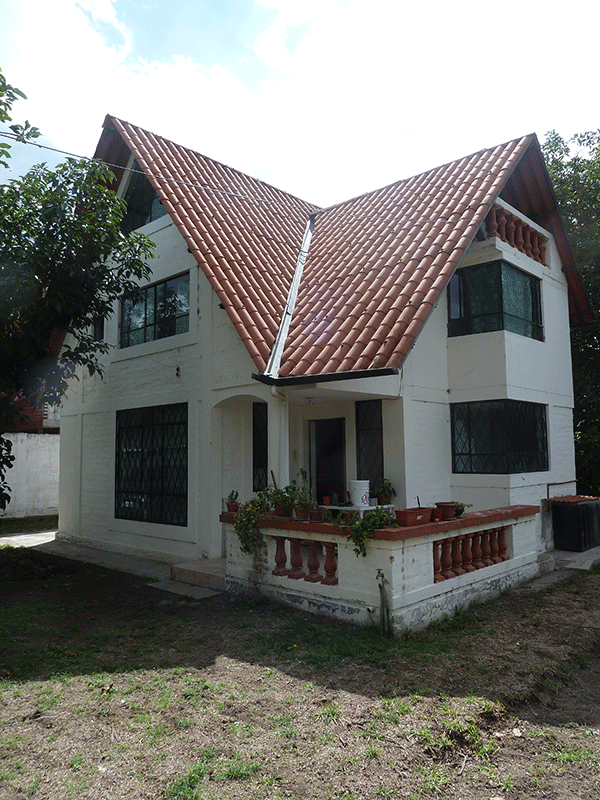 Aunque esta casa es pequeña, un año pasa pronto, sobre todo si estarás pendiente de la construcción de tu nuevo nido, que será a tu gusto y necesidades. Suerte, amiga, y que tu hogar permanente sea … de revista!!! I hope you will be very happy at your new house! It looks really beautiful! Wish you all the best there! Share more information how are the things going now. Me alegro que estas mas cerca que el Quinche. Estoy de regreso en Quito. (Llegue comos hace un mes directo a trabajar. Regrese al colegio FCAQ) Hay tanto que conversar. Ojala me puedas enviar tu nueva dirección y teléfono. El mio sigue siendo el mismo. Angie – you lead a very interesting life. Kinda like your “Life’s a Hoot” pattern. Thanks for sharing your living spaces. 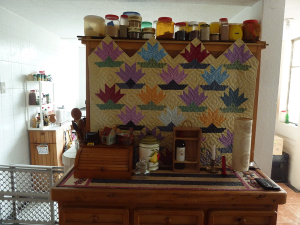 ps: how about a curtain/quilt as a bathroom door? Love your work and am working on the “Be Kind” wall hanging. I’ll share when it’s done. Thanks – God bless.